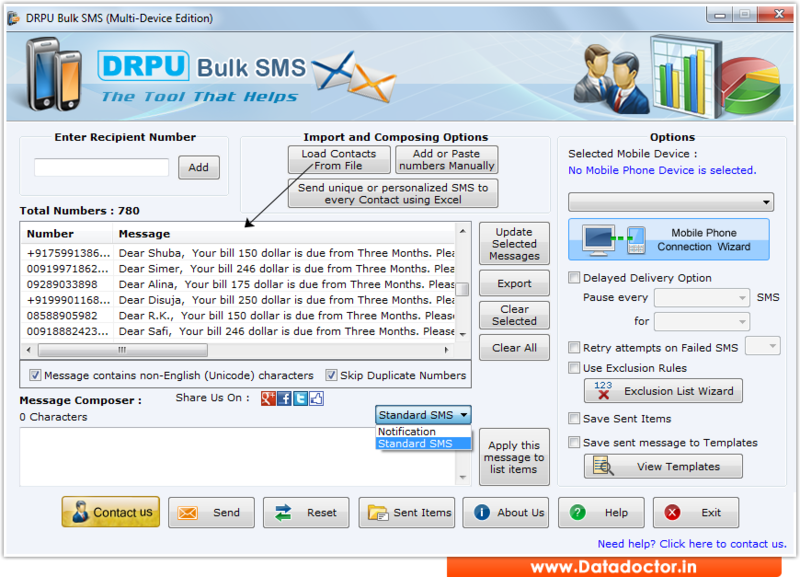 Bulk SMS software offers facility to compose and send group text messages from computer system via connecting multiple GSM technology based mobile phones. SMS software facilitates to promote business products among worldwide audience by bulk SMS marketing campaigns. SMS broadcasting program delivers multiple text alerts and drive traffic towards your business. Send text messaging tool allows user to skip duplicate contact number entries during message sending process. Group text messaging software works with all major brands of cell phones to send bulk text messages without internet gateway. Bulk SMS software provides facility to compose and send standard SMS or notifications as per user choice. Professional SMS broadcasting tool enables you to connect multiple GSM technology based mobiles with your computer system to send group text messages. » Group SMS software facilitates to connect multiple mobiles with computer system at same time and send text alerts. » Promote your product brands or services among worldwide mobile audience using bulk SMS software for multi mobile. » Software supports Unicode languages to send bulk messages in any format. » Provides inbuilt delay delivery option to control and customize the load of bulk SMS broadcasting. » Increase your business revenue and sales by interacting with global customers and clients via bulk SMS software.